Ald. Carlos Ramirez-Rosa (35th) (l). and Ald. Proco Joe Moreno (1st) are among a group of five aldermen seeking to fund local schools through a TIF surplus. LOGAN SQUARE — A group of aldermen are seeking to circumvent a stalled effort to provide economic relief to schools by using money from a Tax Increment Financing ditrict. That effort, which failed to come up for a vote during Monday's City Council meeting, would have set a process to declare a TIF surplus and distribute money from the TIF district to CPS. Now five aldermen whose wards include the Fullerton/Milwaukee TIF are putting forward a proposal of how the surplus would be structured to help neighborhood schools. The aldermen behind the effort are Proco Joe Moreno (1st), Roberto Maldonado (26th), Ariel Reboyras (30th), Scott Waguespack (32nd) and Carlos Ramirez-Rosa (35th). 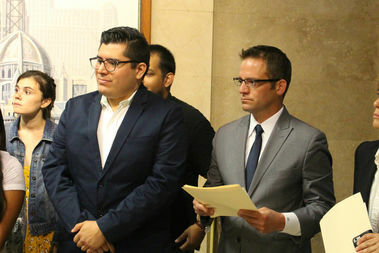 The aldermen sent a joint letter to city budget director Alex Holt outlining their stop-gap measure to alleviate some of the ongoing budget crisis at CPS. The group of aldermen is asking that the surplus include the city's 20 percent share to CPS and bring CPS' total share of the surplus to over 70 percent. Given the status of the Fullerton/Milwaukee TIF, the surplus in that district alone would be $1,312,067 in 2017, $2,025,976 in 2018 and $3,114,104 in 2019, according to the memo sent to Holt. Given those totals, the surplus from that specific TIF district would be $6,452,148 over the three-year period, and if 70 percent is sent to CPS that would mean an additional $4,516,503 in funding for schools. "We understand that the July 18, 2016 balance may not reflect projects that are in the early stages of development — like the proposed John Pennycuff Memorial Apartments at Robert Castillo Plaza — and we would like to work with your office to adjust our proposed TIF surplus accordingly," the aldermen wrote in their memo. The group of aldermen noted that the bulk of any TIF surplus must come from the districts in the central business district for it to have any impact on CPS. "We are committed to surplusing funds from the Fullerton/Milwaukee TIF district, in the manner described above, because our neighborhood schools desperately need funding," the memo states.